They might have lost Kirk Hamilton and Stephen Totilo, but every day eight million other people still hop online to water their virtual crops in Zynga's social farming sequel, FarmVille 2. According to the first FarmVille 2 Almanac infographic, 17 of those players are playing from the Vatican. I suspect something more sinister afoot. Are there really 17 people clicking on cows in the Catholic Church's seat of power, or is there just one incredibly powerful man with 17 different accounts accepting his own help requests? I am not inferring that his holiness turns to fake livestock when he turns in his magical wizard hat for the day. I'm just having a great time imagining it. 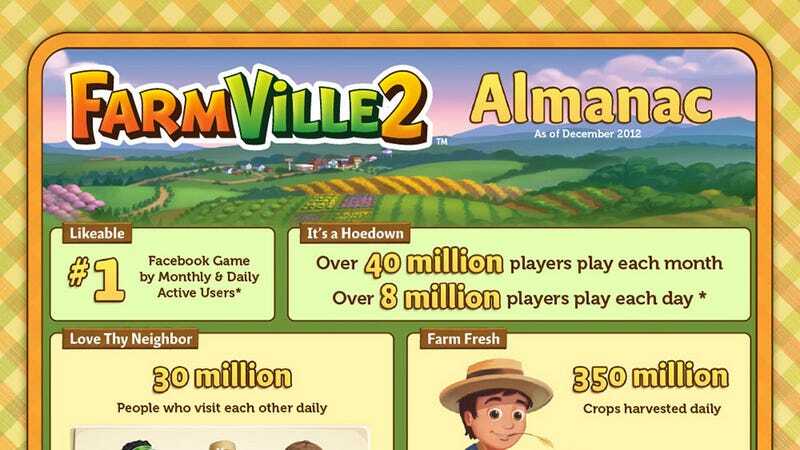 The FarmVille 2 Almanac is filled with thought-provoking, imagination-striking facts. For instance, did you realize that an average of 350 million crops are harvested in the game each day? Do you realize how many starving people that could help keep starving because they aren't real crops? The mind boggles. While it's boggling, note that the game's campaign with Water.org did bring lifetime access to clean water to nearly 18,000 people that otherwise would have gone without. Bet you feel bad about laughing at my virtual crops now. Nah, go ahead, they're pretty funny. Click the image below for the full infographic.